This month, the $12.5-million Bugatti La Voiture Noire debuted at the Geneva Motor Show, mysteriously letting us gaze upon its exterior glory and nothing else. But there was a reason, other than the fact that we’re not rich enough to handle it: The car won’t actually be done for at least another two years. 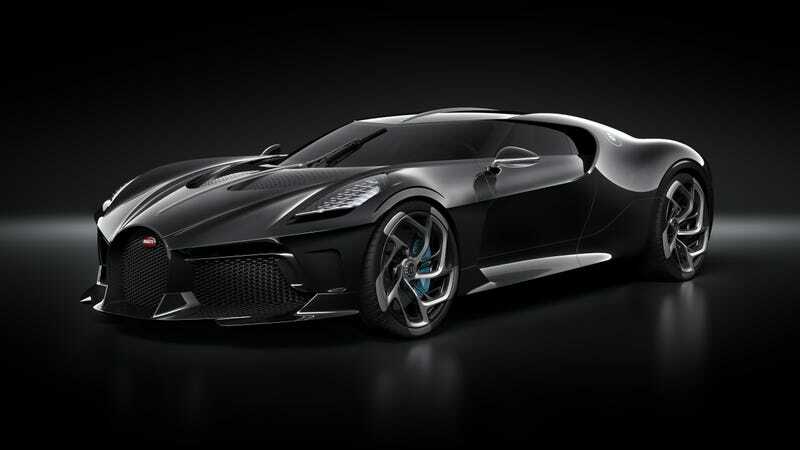 The La Voiture Noire, which means “the black car” in French, showed up at Geneva as a one-off car with a carbon-fiber body, Bugatti’s signature 1,500-horsepower, quad-turbo, 8.0-liter W16 engine and a price of about $19 million after taxes. But video of the car making a slow and eerily quiet drive outside of the show wound up on YouTube not long after the debut, and Carscoops asked Bugatti for more info about what exactly was on display at Geneva. Carscoops wrote that the supercar at the show had neither its W16 engine nor an interior, which is why we only ever saw it from the outside. We at Jalopnik just figured we weren’t wealthy enough to look at the interior without sunglasses or significantly higher credit lines, which is also highly probable. The car currently has an electric powertrain instead of its real one, according to Carscoops, so that it can move around at shows and other events without being pushed. So, yeah, that fancy new, one-off Bugatti we all gawked over the price of was really just a hollow display for now, probably with less of an interior than the slightly suspicious Miata you picked up from Craigslist for $4,000. That’ll all change over the next couple of years, though, and we can all go back to feeling unworthy once it does.